, an eminent grammarian in Italy, was born at Cosenza in the kingdom of Naples, in 1470. He was designed for the law, the profession of his ancestors but his inclination was to study classical literature. His family name was Giovanni Paulo Parisio; yet, according to the humour of the grammarians of that age, he adopted that under which we have classed him. He taught at Milan with great reputation, being particularly admired for a graceful delivery, which attracted many auditors to his lectures. He went to Rome during the pontificate of Alexander VI. and was like to have been involved in the misfortunes of the cardinals Bernardini Cajetan, and Silius Savello, whose estates were confiscateed, | and themselves banished for conspiring to depose the pope. As it was well known that he had corresponded with these men, he took the advice of a friend, in retiring from Rome. 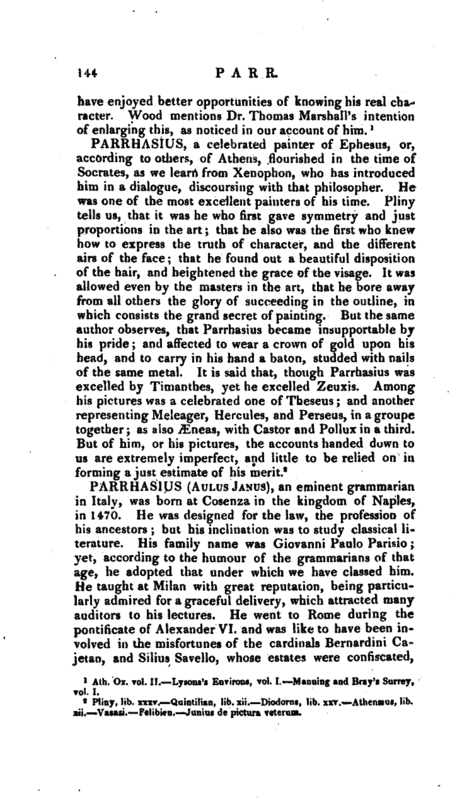 Not long after, he was appointed public professor of rhetoric at Milan, where his superior merit drew upon him the envy of his contemporary teachers, who, by false accusations, rendered his situation so uneasy, that he was obliged to leave Milan, and retire to Vicenza, where he obtained the professorship of eloquence, with a larger salary; and he held this professorship, till the states of the Venetians were laid waste by the troops of the league of Cambray. He now withdrew to his native country, having made his escape through the army of the enemies. He was afterwards sent for by Leo X. who was before favourably inclined to him; and on his arrival at Rome, appointed him professor of polite literature. 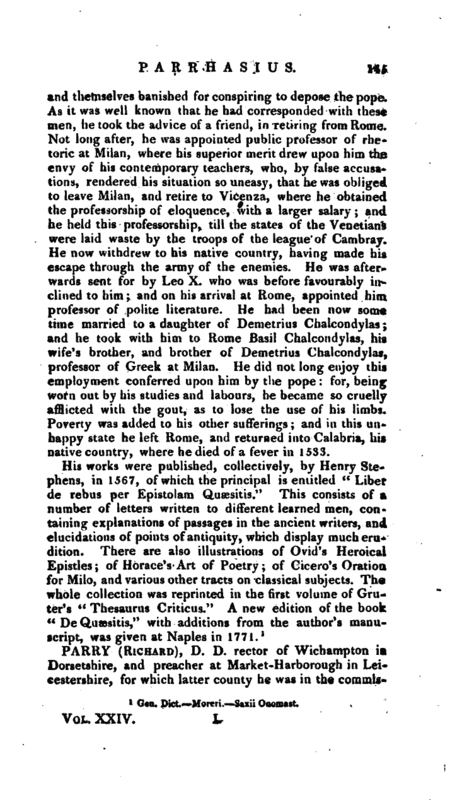 He had been now some time married to a daughter of Denietrius Chalcondylas; and he took with him to Rome Basil Chalcondylas, his wife’s brother, and brother of Demetrius Chalcondylas, professor of Greek at Milan. He did not long enjoy this employment conferred upon him by the pope: for; being worn out by his studies and labours, he became so cruelly afflicted with the gout, as to lose the use of his limbs. Poverty was added to his other sufferings; and in this unhappy state he left Rome, and returned into Calabria, his native country, where he died of a fever in 1533.